DAWN was recently recognized by Zions Bank as one of ten Top Businesses in Idaho in 2017. 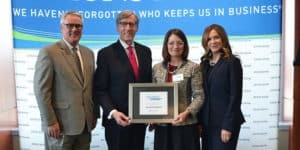 Each year Zions Bank features about 370 businesses on their “Speaking on Business” radio show, and selects ten that exemplify the best of Idaho business to be honored for innovation, growth, and contribution to their communities. This year they chose DAWN. As you know, Judy’s work at DAWN (and at Palouse Dementia Care) is to make strength-based dementia care available to families and dementia caregivers everywhere through her books, classes, and talks. Many thanks for your support and goodwill!